"I just need to hire one, maybe two good men." 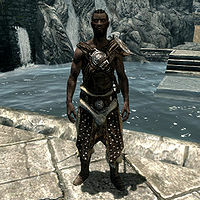 Amren is a Redguard warrior and the common trainer for One-handed. He and his wife, Saffir, have a daughter named Braith. They live in their house in the Wind District of Whiterun. 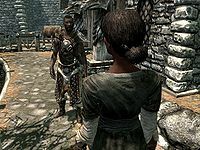 With a bookworm for a wife and a daughter that spends her time bullying Lars Battle-Born, Amren spends as little time in the house as he possibly can and focuses on patrolling the streets of Whiterun. He rarely sleeps and starts patrolling at 2am and keeps going until he enters the house at 7pm in the evening. He then spends four hours with the family, either eating, sleeping or wandering around. At 11pm he goes to the Drunken Huntsman for a few drinks before it is time to patrol again. On Tirdas and Turdas he breaks off from his normal routine at 10am and spends four hours inside Dragonsreach, either eating or wandering about. If Whiterun is attacked as part of the civil war, he will participate in rebuilding the city every day between 8am and 11am. Amren wears studded armor and hide boots and has a steel sword equipped. He carries the house key, a belted tunic, and a selection of common items and gold. When you approach him, he will make quite a few statements: "You tried mercenary work? It might suit you. ", "Sometimes I miss the soldier's life, but when I hold my daughter in my arms, I know I made the right choice." or "My wife's a good woman. She can be a little hard-headed sometimes, but I love her just the same." or, if Saffir is dead: "My wife was a good woman. She could be a little hard-headed sometimes, but I loved her just the same. Gods I miss her." You can also ask the obvious question that he is not from Skyrim, which will make him answer, depending on your race. If you are a Nord he will say: "Hmph. No, friend, that I'm not. But I get along with your kind well enough." If you are a Redguard, he was supposed to respond with, "Ha! And neither are you, eh? Good to see another Redguard. I like to think we bring a little heat to this frozen wasteland." but doesn't due to a bug. If you are any other race you will get: "No, I'm not. Looks like we've got something in common, then." In all three cases, he will continue with: "No, I'm a Redguard. My family hails from the Imperial Province. Ah, but I left home when I was just a lad. Been wandering ever since." If asked for training, he will reply, "I can teach you a few things." Saffir: "I know your family's honor is important to you, but we can't afford it!" Amren: "It took me weeks to find that thieves' den. I can't stop now, and I can't get the sword on my own." Saffir: "So you're willing to starve your wife and daughter to reclaim some rusty old sword?" Amren: "I just need to hire one, maybe two good men. You won't starve." Saffir:" I'll put it plainly. You can claim your sword, or you can keep your wife. If you set foot outside the gate, I won't be here when you return." Asking him about the argument will make him say: "My Saffir doesn't like that I've been spending so much time looking for my father's old sword. He fed his entire family with the gold he made using that weapon. I'm not about to let it gather dust in some thief's trophy room." If you offer to help him, he will respond: "I tracked it to a group of bandits nearby. But I'm no fool. I'd need the Whiterun guards or maybe hire the Companions to get it. I don't know why I'm saying this, but if you find it out in your travels, I'd be grateful to you." When you return with the sword, he will be happy: "You found it? I've been looking for that blade for months. You took on all those bandits yourself? Thank you. Here, my father had a favorite sword and shield technique. Let me teach it to you, in honor of his memory." He will then provide one-point bonuses to your Block and One-handed skills, then be on his way. Braith: "Papa, the next time you go away, I want to come with you." Amren: "When I go away, I go to war. That's no place for a little girl." Braith: "Every knight needs a squire. I could help you with your sword, things like that." Amren: "Nice try, blossom, but I'm not a knight, I'm a mercenary. The answer's still no. Besides, your mother would miss you too much." Braith: "Papa, I want to talk to you..."
Braith: "Well, there's this boy, and..."
Amren: "Listen, Braith... Why don't you talk to your mother about this, okay? There's a good girl." or "I wish your mother were still alive. She could answer you much better. Let me think on it and we'll talk later." When asked the question "You're not from Skyrim, are you? ", he is supposed to have three different dialogue responses, depending on your race. However, for the Redguard-specific dialogue, the game mistakenly checks if your race is Nord. Due to this, Redguard players will not have the correct dialogue option. Amren also appears in the card expansion Heroes of Skyrim for Legends as the card Battlefield Scrounger. This page was last modified on 12 February 2019, at 03:57.